I started a little project, namely trying to visualize the legendary weapon dps progression. There is a first version that just displays DPS at rank 7 for one handed physical damage weapons. Seeing as for 3rd age, each level of item actually exists (although level 69 and 70 ary VERY rare), that doesn't hold true for second and first age weapons, as most of you might be aware. I am therefore in the process of showing the appriate data in the second version of the diagram as well, though I am not entirely sure how to do this so it is easily understandable. Now, as the titles say, this is still very much work in progress and a lot is left to be done (for one, I plan a direct comparison feature). But apart from improving the visual appearance etc, I need more data. So, guys, if you could help me with screenshots of all kinds of LIs (1st, 2nd, 3rd age, levels 51 - 75 (soon 85), crystals applied etc. ), it would be much appreciated. 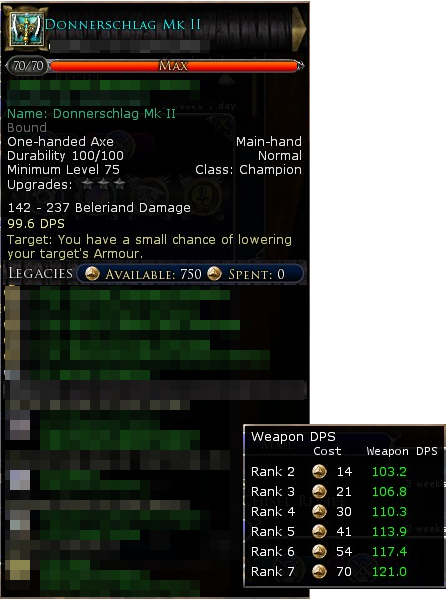 What I would need is two screenshots per item, where the main stat (physical, tactical damage, tactical heal rating, shield use rank or incoming heal rating) is NOT leveled, so you can see the base value (screenshot one: weapon tooltip without points put into it) as well as the tooltip for the main stat (screenshot two: tooltip of main stat, also without points put into, so you see rank 1 - 7). Also, if you have any suggestions regarding the diagrams itself, feel free to post them. Values with crystals are in parenthesis. Shift ranks accordingly. Last edited by Equendil; Oct 09 2012 at 09:44 PM. For the legendary items where you have 6 numbers for the 3 crystals. Please remove 3 of the numbers. I am only interested in the actual value after the addiiton of each crystal. The extra intermediate value that you computed that we never see is confusing. Most awesome! Thanks a bunch. That will do nicely, though I can't help noticing that it makes even less sense now that I see it than what I imagined. I mean, not even the 3rd ages are consistent. I had thought (or hoped, as I already saw a few anomalies) that the ranks where just an effective level higher, but it doesn't work throughout all the levels, as I see there in your data. Now they also added another complexity on top of all the confusing mess with the crystals and it makes even less sense? I had thought the first crystal on 2nd age 75 was a bug in being a two rank jump. One would at least have been logical, as 3 steps of 3.55 dps would put it just below a first age without a crystal, but no. I am half expecting that not even the guys at Turbine are having an idea left how all these numbers are supposed to play together. So that makes lvl 65+ 3rd age essentially gain 5/3 effective level per crystal and 2nd age two. Gotcha, although, as I said, it seems completely unnecessary to do it intricately like that. Anyway, thanks again, +rep and all. No offense, but I started the thread and I couldn't care less what you are not interested to see. I specifically ASKED for the information presented because the diagram is supposed to help me (and others, hopefully) to make some sense of all of this. Yeah, it's a bit of an ad hoc system this. There's some consistency, but I think there's been a conflict between scaling up for ranks and scaling up for levels using the same 'sliding' values for both. Plus some readjustments come expansions. As a result, Turbine has made legendary items effectively 'jump' 8-10 levels (10 for rating legacies, 8 or 9 for DPS etc, still trying to make sense of it) between level 75 and 76, including third age items. That's on top of previous such 'jumps' (+1 for 2nd ages, +2 for 1st ages since SoA, another +4 and +9 for 2nd and 1st ages respectively at level 75). Well, I wouldn't exclude bugs regarding crystals at this point, I've seen weirder stuff occurring at the release of RoI, with legacies arbitrarily 'skipping' or losing ranks, costs at related ranks doubled or tripled (largely fixed in Update 5 save for a couple hunter legacies). Anyway, posting Tactical rating stuff below. Note: There seems to be an inconsistency between level 76 and 80 as there's a 'shift' of 5 values where you would expect 4, maybe I forgot I had applied a crystal to the level 80 one, will have to double check. Incoming Healing Rating has been revised with RoR as it was left a mess with RoI (level 75 tools and runes having equal or worse ratings than at level 65). The system differs from other ratings, each rank gets upgraded with level/crystal/age, no shifting of values. As far as I can tell, Incoming Healing Rating is just a linear function based on original ratings (say 240,440,640,840,1040,1240,1440 - 3rd age level 60). Last edited by Equendil; Oct 09 2012 at 03:40 PM. Incoming Healing Rating has been revised with RoR as it was left a mess with RoR (level 75 tools and runes having equal or worse ratings than at level 65). I'll copy/paste the raw stuff I gathered (rank 1 to 7 horizontally, 0 to 4 crystals vertically): . And thank you for the raw data on healing ratings! I am not yet sure how to best store the data. Originally, I meant to use the sliding window, but this proves difficult indeed with all the exceptions, jumps and whatnot (see the code if interested how I handle it now). What I basically want to avoid is duplication existing values, if at all doable. Will need to think about how to achieve this. For now, I cleaned the code up quite a bit, will make it much easier now to add 2handers and class items. I also added more of your 1hander data, but it is now quite messy to look at. Will need to add left/right clickable selections now and add the details like dps ranks 1 - 6 and crystals only to those to not overload the overall image with dots and lines. If you guys have any ideas to improve this, don't hesitate. Edit: OK, I think it's not so bad now. Changed the crystal "half" steps to be displayed as such. The lines are now extremely jagged, but it's the data after all. &&&& in, &&&& out. Last edited by SNy-lotrolinux-EU; Oct 09 2012 at 06:17 PM. Sorry to bother you again, but 85 3rd age 1hand is missing something. It's only R1-R6 and then three values for crystals. Last edited by SNy-lotrolinux-EU; Oct 09 2012 at 07:11 PM. Yep, realized that as I processed my data as well, missing rank is 134.8, I checked. Also, a correction to what I said: level 77+ items are shifted 9 'effective levels' for all ratings (legacies or DPS etc), level 76 items are only shifted 8 for some reason (hence the noted 'jump' between level 76 and 77). Tactical Damage, Tactical Healing and Incoming Healing also appear to be shifted yet another 'level' on level 75 first age LIs. I also implemented the new Incoming Healing Rating for my plugin, other than the level shifting here and there, these ratings scale linearly indeed from the original ratings (I used ratings at level 60 and 65 as a reference since they're identical before RoR and on beta). Last edited by Equendil; Oct 09 2012 at 09:56 PM. If this is WAI I don't think I would ever level these up to rank 7 again. I could save 124 points to apply elsewhere and only lose 1.5 DPS. This is not such a bad thing in my opinion, it gives you a real option to spend your points elsewhere. Spending all 230 points into weapon ratings was too much of a no-brainer before. OK, I added the 2h DPS values for now, cleaned up further and also have a version up to level 85 (li-dps-III) but that looks really silly. Need to think about how do present it better. Looks interesting, especially the healing rating being very different from the others. Will add the incoming healing rating and bridle fury generation rating later. Really useful thanks for compiling this. Note to other users bows do fit the 2H weapons (or atleast they do for my 1st age lvl 60 bow and 59 second age). I had been using lotro mmorsel great LI spender tool which has more scope but is not so good for comparing when its necessary to switch for a DPS class. I.E. easy to do a lvl60 FA vs 3rd age lvl 65 comparison for DPS. so thank you for making our LI choices easier! Elendilmir - 95 Hunter Berenthalion - 80ish Burg Berendybuck - baby warden Berenion. I finally came around to add a way to select and compare different entries from the graph. Oh, and if someone could send me data for 85 first age stuff, that would be awesome. So if I am reading these graphs correctly..
Would an investment of a few gold at level 60 for a reforged 2nd age weapon that is not replaced until say level 70 or 75, be a better investment then grinding out 3rd agers every few levels from the same 60-70 or 75 range? You can get a level 60 first ager just by running Turtle (Filikul) six days in a row on one character. If that is your conclusion, then it appears that you are, in fact, not reading these graphs correctly. For starters, the error is in assuming there actually was any investment into 3rd agers while leveling. There is none. Use the highest level LI available to you, throw it away ASAP. Rinse, repeat. Investment of some sort would be needed for lower level, earlier age to try and keep up with what a higher level 3rd age would be capable of, and it would be a wasted one. Then what you are saying is...pre level 85 there really is no reason to make any investment at all into acquiring anything except a 3rd age weapon. Once you hit 85 (or whatever the level cap is) then it might make some sense into acquiring one.